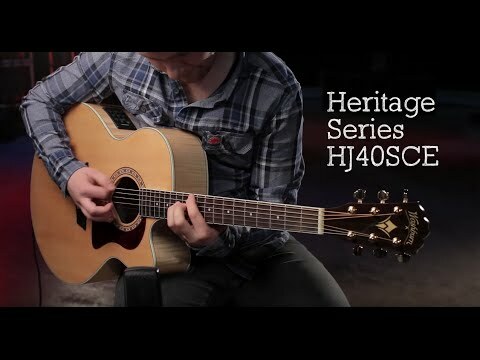 The HJ40SCE is a jumbo acoustic guitar with cutaway for superior upper fret access. It features a solid Sitka spruce top, Cathedral Peaked Advanced Scalloped-X bracing and an environmentally friendly UV cured Polyester finish for superior tone that improves with age, beautiful Flame Maple back and sides, a mahogany neck with a Ovankol fingerboard and bridge, gold diecast tuners for quick, easy and accurate tuning, a Washburn tortoise pickguard and a custom rosette. The HJ40SCE features visually stunning Flame Maple for its back and side wood. Maple is a bright sounding tone wood that works perfectly with the jumbo body style, brings some high end focus to this big sounding guitar. Thanks to its built in Fisman 501T Tuner/Preamp, you'll never need to carry around an extra tuner. The preamp features volume, bass, middle, treble and brilliance control for natural amplified acoustic tone, plus a phase switch and notch control to deal with feedback issues.